Selina surf club offers a comprehensive set of packages adapted to your needs with the sole aim of offering the perfect surfing holidays in Central America. Selina believes that they are part of the experience and therefore it has to be memorable where you will find a different concept here. Selina is known for being the most authentic and continues to keep the real surf spirit and shares with you the unique Costa Rica-Jacó experience. Teeming with energy, its main drag seemingly bursting at the seams, Jacó brings together locals and foreigners, snowbirds and surfers, revelers, and families. Just a quick trip from San Jose, Selina’s brand-new property in one of Costa Rica’s most popular destination stands out for its connectivity, sense of community, and commitment to sustainability. You will not want to be anywhere else. 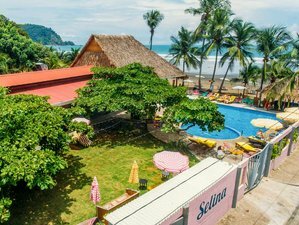 Selina’s unique hostel concept has finally arrived in this bustling beach town, a place for friends, and meaningful connections to be made. This is where the tribe congregates whether at the swimming pool, cinema room, or playground. Partner up in salsa lessons, morning yoga, or in the weekend dance parties. More than just that, the restaurant will also delight you with eclectic dishes and drinks. Jaco’s easy access and history with international tourism offer a great choice for first-time visitors to Costa Rica. With a community-centric approach, Selina provides a truly sustainable alternative to the many lodging options here. Surfing, scuba diving, kayaking, and access to a pristine nature reserve are just some of the attractions in a place that also offers great cuisine, an eclectic nightlife, and most modern conveniences. Selina surf club teaches surfers of all levels. Selina provides surf lessons for those who want to learn on how to step on to the water and surfers that want to improve having more speed and control in the green waves. Selina also provides lessons for advanced surfers who want to go one step further in their technique and style. Selina's professional and experienced surf teachers will coach you. They will get you to that next level and help you get the most from your surfing. Selina uses the latest and most advanced equipment to provide the best feeling ever where all the lessons include surfboard and all equipment needed. Selina has incredible year-round surf conditions for all surfing levels, probably one of the best places worldwide to improve your surfing or learn to surf for the first time. This retreat will take place in the beautiful city of Jaco, Puntarenas, Costa Rica. Costa Rica is known for its miles of white sandy beaches, monkeys swinging in the trees that line the sand, and endless waves that begged to be ridden. With the name Costa Rica meaning the “rich coast”, it certainly lives up to its name by having some of the best-surfing destinations in the world. From beginner to advanced, there is a wave for everyone along one of Costa Rica’s hundreds of beaches. Unpaved roads and hidden paradises have kept these magnificent beaches from becoming overcrowded and will have you feeling as though you are entering a secret paradise. Selina surf club is located in Playa Jaco spot. Jaco has incredible year-round surf conditions for all surfing levels, probably one of the best places worldwide to improve your surfing or learn to surf for the first time. It is located just 10 - 15 minutes of rest of the most important spots in the area. Playa Jaco is a surfer’s sanctuary. There is no doubt that Jaco is one of the best places to begin your surfing journey. Beginners can learn to ride here and veterans can get their groove back. The long beach of Jaco features a small beach break with lots of peaks. The waves break over a sandy bottom to the right and left. Although the waves have an average quality with an ordinary power, they remain consistent throughout the year and provide a great base for all sorts of surfers. Good swells are raised from northwest and southwest direction. Unlike other beaches, a southern swell creates small surf as it is protected by a western bay. Superb waves are generated at mid to high tide when it is rising. The best time to surf is two hours before a high tide. During a low tide, beginners can learn to surf in the whitewater. From hard-core surfing to family-friendly activities, Jacó has it all. You can ride on horseback through the rainforest or take an ATV tour to waterfalls and beaches off the beaten path. Take a leap, either with a bungee cord or with a zipline through the forest canopy. Other tours include scuba diving, sports fishing, and sea kayaking. The town offers every modern convenience, as well as great cuisine and shopping and an all-you-can-handle nightlife. Please book your flight to arrive at Juan Santamaría International Airport (SJO) or Daniel Oduber Quirós International Airport (LIR). Transfer from and to this airport is available upon request. Juan Santamaría International Airport (SJO) and Daniel Oduber Quirós International Airport (LIR) are located approximately 1.30 and 2.50 hours from the venue respectively. Single occupancy in the unique room is also available for 745 USD in low season and 835 USD in high season per person.